ciaopp is a standalone preprocessor to the standard clause-level compiler. It performs source-to-source transformations. The input to ciaopp are logic programs (optionally with assertions and syntactic extensions). 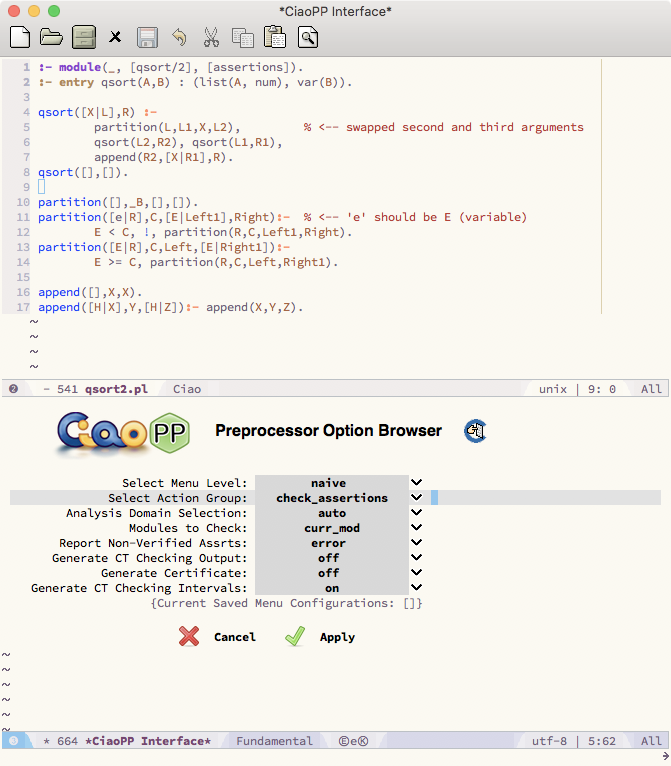 The output are error/warning messages plus the transformed logic program, with results of analysis (as assertions), results of static checking of assertions, assertion run-time checking code, and optimizations (specialization, parallelization, etc.). Getting Started gives the “getting started” basics. Static Analysis and Program Assertions shows how ciaopp performs program analysis. Program Debugging and Assertion Validation does the same for program debugging and validation. Source Program Optimization presents ciaopp at work for program transformation and optimization. A ciaopp session consists in the preprocessing of a file. The session is governed by a menu, where you can choose the kind of preprocessing you want to be done to your file among several analyses and program transformations available. This tutorial shows how to customize the preprocessing but some predefined preprocessing options are described in CiaoPP Quick Tutorial. Except for the first line, which refers to selecting levels of customization. You can select analysis (analyze), assertion checking (check_assertions), certificate checking (check_certificate), or program optimization (optimize), and you can later combine the four kinds of preprocessing. The relevant options for the action group selected are then shown, together with the relevant flags. A description of the values for each option will be given as it is used in the corresponding section of this tutorial. The fundamental functionality behind CiaoPP is static global program analysis, based on abstract interpretation. For this task CiaoPP uses the PLAI abstract interpreter [MH92,BGH99]. The system infers information on variable-level properties such as moded types, definiteness, freeness, independence, and grounding dependencies: essentially, precise data structure shape and pointer sharing. It can also infer bounds on data structure sizes, as well as procedure-level properties such as determinacy, termination, non-failure, and bounds on resource consumption (time or space cost). CiaoPP implements several techniques for dealing with “difficult” language features (such as side-effects, meta-programming, higher-order, etc.) and as a result can for example deal safely with arbitrary ISO-Prolog programs [BCHP96]. 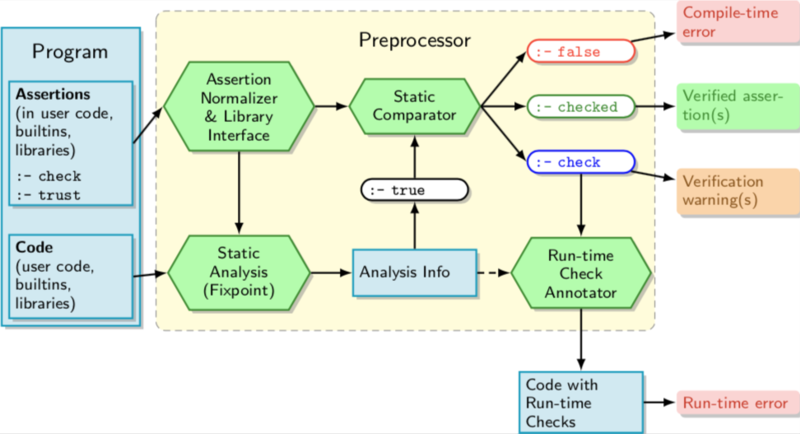 A unified language of assertions [BCHP96,PBH00b] is used to express the results of analysis, to provide input to the analyzer of program specifications for debugging and validation, as well as the results of the comparisons performed against the specifications. :- entry qsort(A,B) : (list(A, num), var(B)). E < C, !, partition(R,C,Left1,Right). The sharing and freenes analysis abstract domain computes freeness, independence, and grounding dependencies between program variables. => ( ground(A), ground(C), ground(D), mshare([[B]]) ). => ( ground(A), mshare([[B,C]]) ). These assertions express, for example, that the third and fourth arguments of partition have “output mode”: when partition is called (:) C and D are free unaliased variables and they are ground on success (=>). Also, append is used in a mode in which the first argument is input (i.e., ground on call). 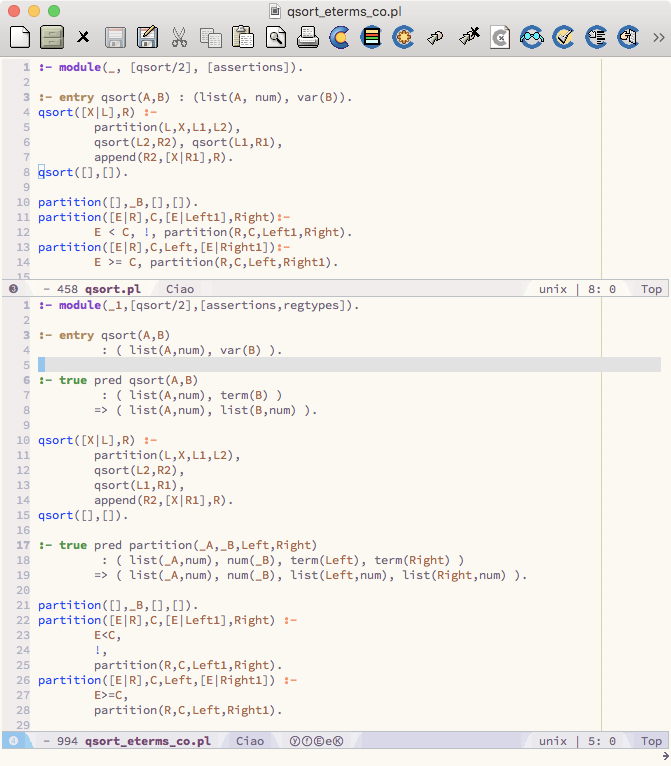 Also, upon success the arguments of qsort will share all variables (if any). => ( list(A,num), list(B,num) ). => ( list(_A,num), num(_B), list(Left,num), list(Right,num) ). => ( list(_A,num), rt5(X), rt11(_B) ). :- regtype list(L,T) #"L is a list of T&apos;s.". This informs the analyzer that in all external calls to qsort, the first argument will be a list of numbers and the second a free variable. Note the use of builtin properties (i.e., defined in modules which are loaded by default, such as var, num, list, etc.). Note also that properties natively understood by different analysis domains can be combined in the same assertion. + ( not_fails, covered ). 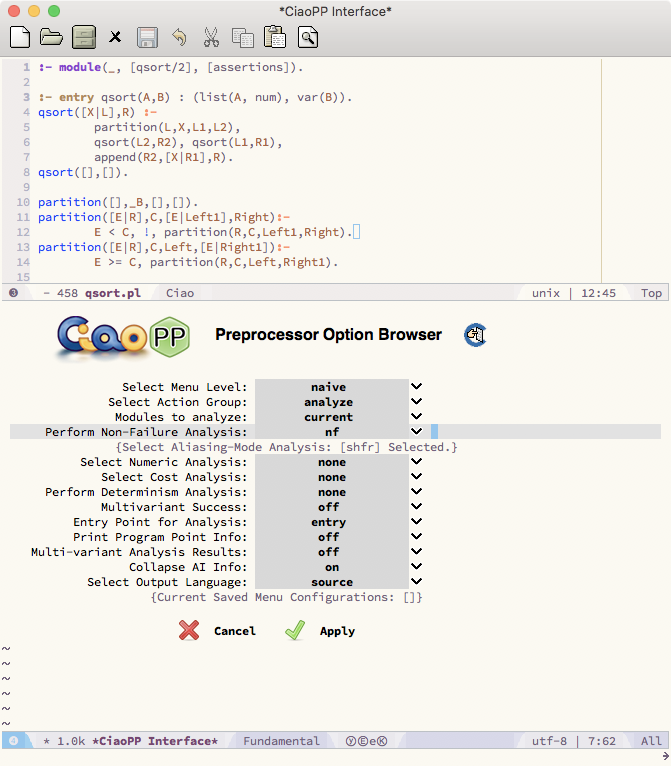 The + field in pred assertions can contain a conjunction of global properties of the computation of the predicate. not_fails states that if the precondition is met, the predicate will never fail. CiaoPP can also infer lower and upper bounds on the sizes of terms and the computational cost of predicates [DLGHL94,DLGHL97]. The cost bounds are expressed as functions on the sizes of the input arguments and yield the number of resolution steps. Various measures are used for the “size” of an input, such as list-length, term-size, term-depth, integer-value, etc. Note that obtaining a non-infinite upper bound on cost also implies proving termination of the predicate. For example, the second assertion is inferring on success size(ub,_B,length(X)+length(_A)), which means that an (upper) bound on the size of the third argument of append/3 is the sum of the sizes of the first and second arguments. The inferred upper bound on computational steps (+ cost(ub,steps,length(_A)+1)) is the length of the first argument of append/3. The lower-bounds analysis uses information from the non-failure analysis, without which a trivial lower bound of 0 would be derived. In this case it is inferred that on success the lower bound of the third argument of append is size(lb,_B,length(X)+length(_A)) (the same as the upper bound! ), and the upper bound on computational steps + cost(lb,steps,0), which represents the case in which the first list to concatenate is empty. As a final note on the analyses, it should be pointed out that since most of the inferred properties are in general undecidable at compile-time, the inference technique used, abstract interpretation, is necessarily approximate, i.e., possibly imprecise. On the other hand, such approximations are also always guaranteed to be safe, in the sense that (modulo bugs, of course) they are never incorrect: the properties stated in inferred assertions do always hold of the program. ciaopp is also capable of static assertion checking, and debugging using the ideas outlined so far. To this end, it implements the framework described in [HPB99,PBH00a] which involves several of the tools which comprise ciaopp. The following figure depicts the overall architecture. Hexagons represent the different tools involved and arrows indicate the communication paths among them. Program verification and detection of errors is first performed at compile-time by inferring properties of the program via abstract interpretation-based static analysis and comparing this information against (partial) specifications written in terms of assertions (see [HPBLG05] for a detailed description of the sufficient conditions used for achieving this ciaopp functionality). The static checking is provably safe in the sense that all errors flagged are definite violations of the specifications. As introduced before, assertions are a means of specifying properties which are (or should be) true of a given predicate, predicate argument, and/or program point. See Using assertions for preprocessing programs for a more detailed description, of the concepts that we briefly introduce now. They are of the form :- [Status] Scope Head : Pre => Post + Comp., where Status is a qualifier of the meaning of the assertion, Scope describes where the assertion is applied, Head is a normalized atom, and Pre, Post, and Comp are conjunctions of properties. So far we have seen assertions with Status true, which mean that they express the behavior inferred by the analyzer. 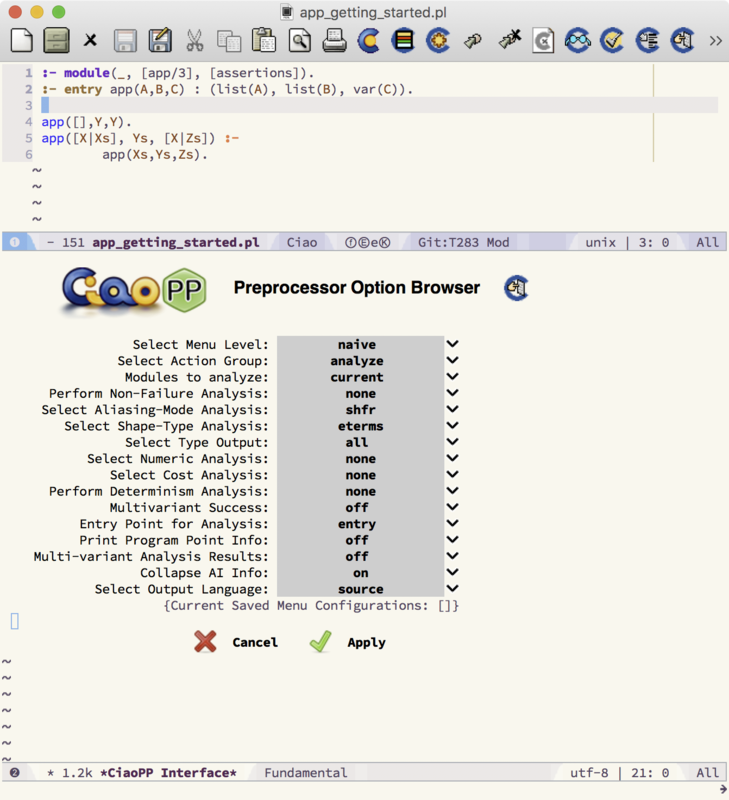 This status can only appear in the output of the analyzer (i.e. the user should not use it). check: (input and output status) default status (i.e., if no status is specified), expresses properties that the user wants ensured to hold at run-time. trust: (input status) the assertion represents an actual behavior of the predicate that the analyzer may not be able to infer automatically. checked: (output status) the assertion was proved to hold statically by the analyzer. false: (output status) the assertion was proved not to hold statically by the analyzer. In CiaoPP properties are predicates, which may be builtin or user defined. For example, the property var used in the above examples is the standard builtin predicate to check for a free variable. The same applies to ground and mshare. The properties used by an analysis in its output (such as var, ground, and mshare for the previous mode analysis) are said to be native for that particular analysis. The system requires that properties be marked as such with a prop declaration which must be visible to the module in which the property is used. :- prop list/1. list :=  | [_|list]. defines the property “list”. A list is an instance of a very useful class of user-defined properties called regular types [YS87,DZ92,GdW94,GP02,VB02], which herein are simply a syntactically restricted class of logic programs. We can mark this fact by stating “:- regtype list/1.” instead of “:- prop list/1.” (this can be done automatically). The definition above can be included in a user program or, alternatively, it can be imported from a system library, e.g. : :- use_module(library(lists),[list/1]). => ( list(A,num), list(B,^(x)) ). where list(B,^x) means “B is a list of atoms x.”. The information inferred does not seem compatible with a correct definition of qsort, which clearly points to a bug in the program. In addition to manual inspection of the analyzer output, ciaopp includes a number of automated facilities to help in the debugging task. For example, ciaopp can find incompatibilities between the ways in which library predicates are called and their intended mode of use, expressed in the form of assertions in the libraries themselves. 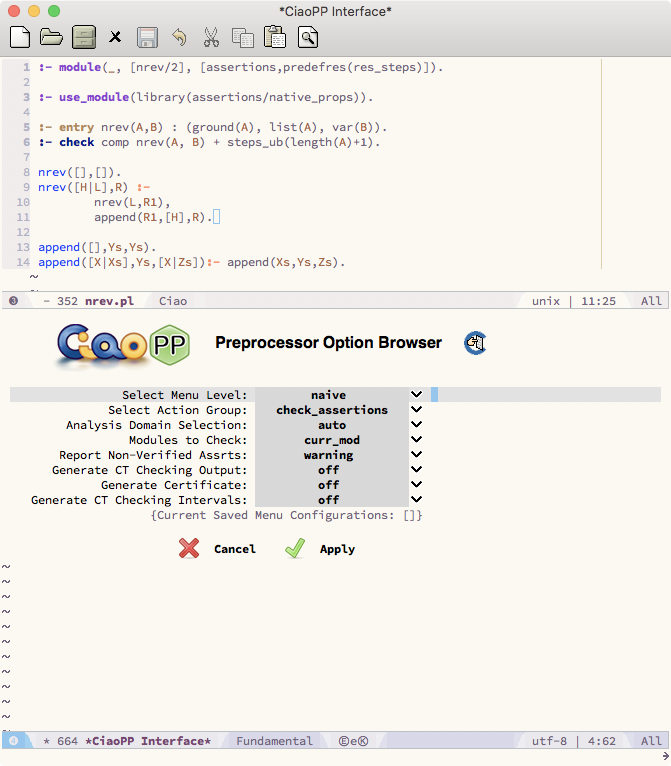 Also, the preprocessor can detect inconsistencies in the program and check the assertions present in other modules used by the program. 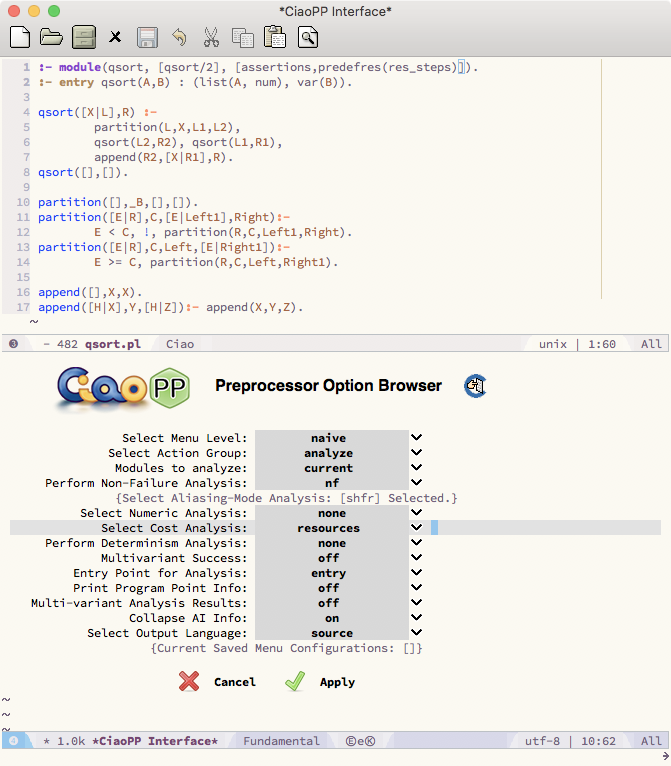 We run compile-time error checking and selecting type and mode analysis for our tentative qsort program, by selecting the action check_assertions. 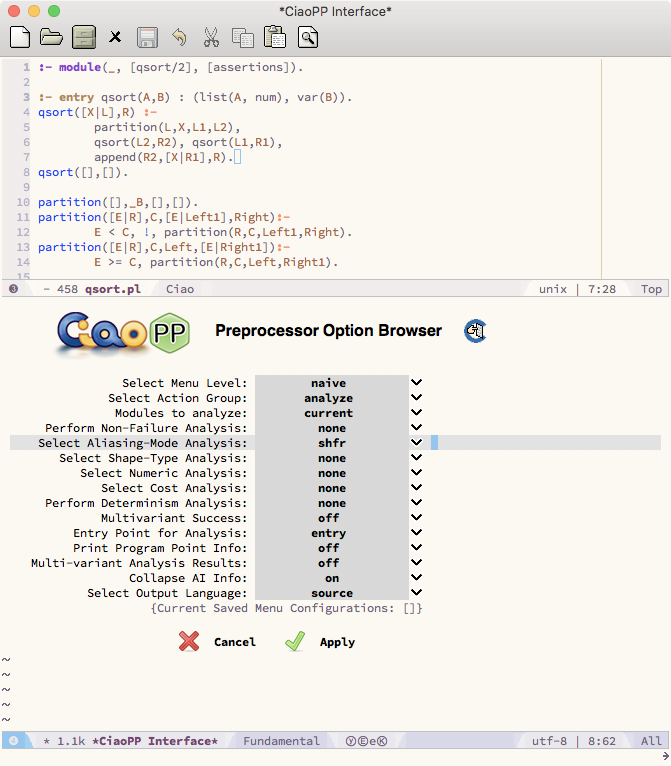 By default, the option Perform Compile-Time Checks is set to auto, which means that the system will automatically detect the analyses to be performed in order to check the program, depending on the information available in the program assertions (in the example in The entry assertion informs how the predicate qsort/2 will be called using types and modes information only). WARNING (preproc_errors): (lns 5-8) goal qsort2:partition(L,L1,X,L2) at literal 1 does not succeed! 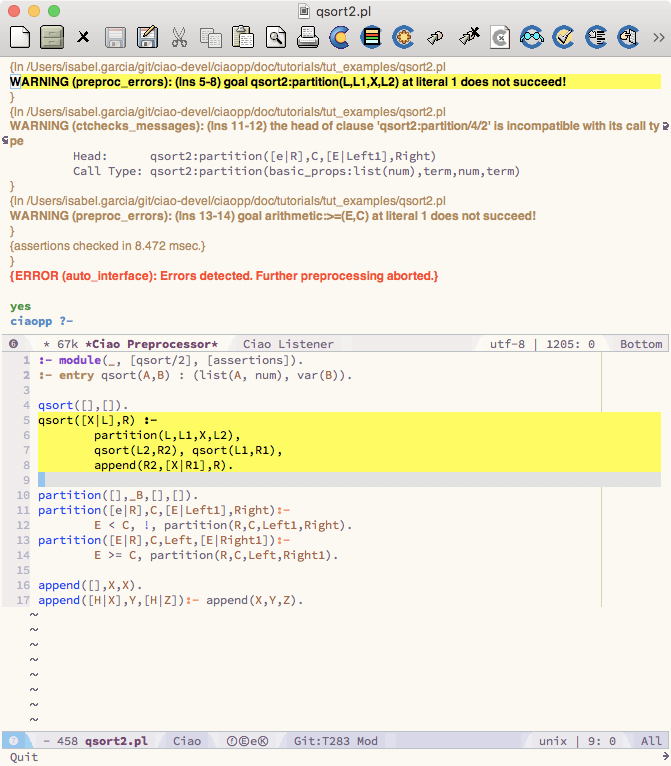 WARNING (preproc_errors): (lns 13-14) goal arithmetic:>=(E,C) at literal 1 does not succeed! :- check calls A>=B : (ground(A), ground(B)). which is present in the default builtins module, and which implies that the two arguments to >=/2 should be ground when this arithmetic predicate is called. 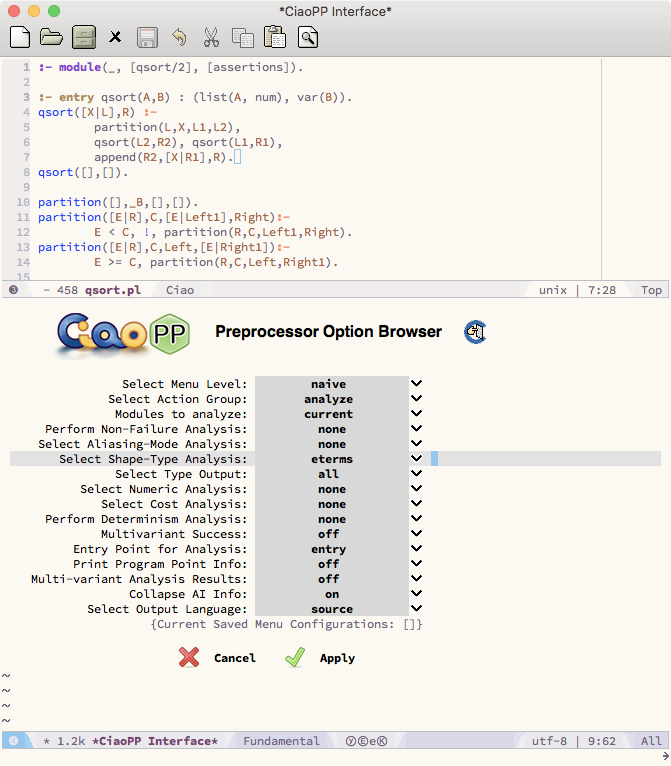 The message signals a compile-time, or abstract, incorrectness symptom [BDD97], indicating that the program does not satisfy the specification given (that of the builtin predicates, in this case). Checking the indicated call to partition and inspecting its arguments we detect that in the definition of qsort, partition is called with the second and third arguments in reversed order -- the correct call is partition(L,X,L1,L2). This time the error is in the second clause of partition. Checking this clause we see that in the first argument of the head there is an e which should be E instead. 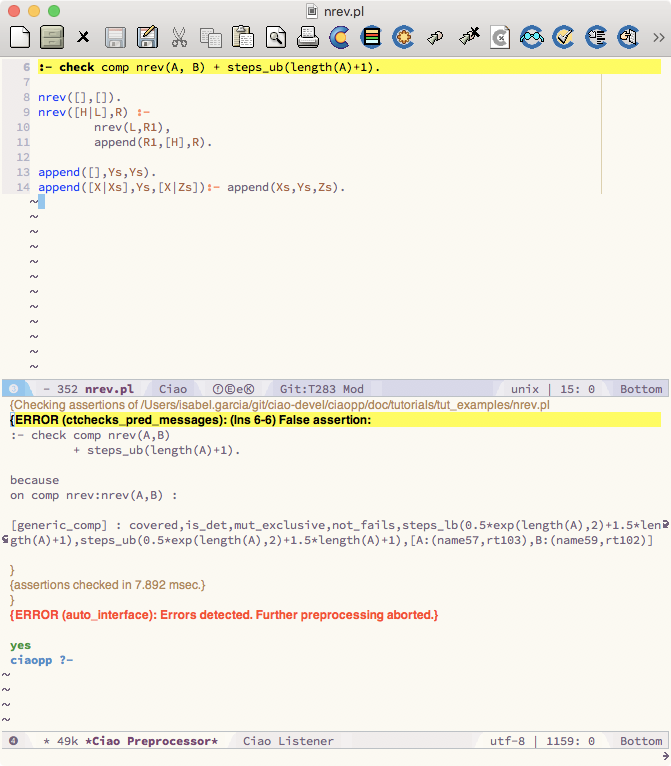 Compile-time checking of the program with this bug corrected does not produce any further warning or error messages. Note: The check prefix is assumed when no prefix is given, as in the example shown. where we also use a new property, sorted_num_list, defined in the module itself. These assertions provide a partial specification of the program. They can be seen as integrity constraints: if their properties do not hold at the corresponding program points (procedure call, procedure exit, etc. ), the program is incorrect. Calls assertions specify properties of all calls to a predicate, while success assertions specify properties of exit points for all calls to a predicate. Properties of successes can be restricted to apply only to calls satisfying certain properties upon entry by adding a “:” field to success assertions. Finally, Comp assertions specify global properties of the execution of a predicate. These include complex properties such as determinacy or termination and are in general not amenable to run-time checking. They can also be restricted to a subset of the calls using “:”. More details on the assertion language can be found in [PBH00b]. The error is now in the call append(R2,[x|R1],R) in qsort (x instead of X). Assertions A1, A3, A4, A6, A7, and A8 have been detected to hold. Note that though the predicate partition may fail in general, in the context of the current program it can be proved not to fail (assertion A6). However, it was not possible to prove statically assertion A2, which has remained with check status. Note also that A2 has been simplified, and this is because the mode analysis has determined that on success the second argument of qsort is ground, and thus this does not have to be checked at run-time. On the other hand the analyses used in our session (types, modes, non-failure, determinism, and upper-bound cost analysis) do not provide enough information to prove that the output of qsort is a sorted list of numbers, since this is not a native property of the analyses being used. While this property could be captured by including a more refined domain (such as constrained types), it is interesting to see what happens with the analyses selected for the example. Note: Note that while property sorted_num_list cannot be proved with only (over approximations) of mode and regular type information, it may be possible to prove that it does not hold (an example of how properties which are not natively understood by the analysis can also be useful for detecting bugs at compile-time): while the regular type analysis cannot capture perfectly the property sorted_num_list, it can still approximate it (by analyzing the definition) as list(B, num). If type analysis for the program were to generate a type for B not compatible with list(B, num), then a definite error symptom would be detected. :- entry nrev(A,B) : (ground(A), list(A), var(B)). :- check comp nrev(A,B) + steps_ub(length(A)+1). Since append is linear, it causes nrev to be quadratic. ciaopp can be used to inform the programmer about this false idea about the cost of nrev. This message states that nrev will take at least resolution steps (which is the cost analysis output), while the assertion requires that it take at most resolution steps. The cost function in the user-provided assertion is compared with the lower-bound cost assertion inferred by analysis. This allows detecting the inconsistency and proving that the program does not satisfy the efficiency requirements imposed. Upper-bound cost assertions can also be proved to hold, i.e., can be checked, by using upper-bound cost analysis rather than lower-bound cost analysis. In such case, it holds when the upper-bound computed by analysis is lower or equal than the upper-bound stated by the user in the assertion. The converse holds for lower-bound cost assertions. :- check comp nrev(A,B) + steps_o(length(A)). This message states that nrev will take at least resolution steps (which is the cost analysis output, as in the previous example), while the assertion requires that the worst case cost of nrev be linear on (the size of the input argument). :- check comp nrev(A,B) + steps_o(exp(length(A),2)). :- checked comp nrev(A,_1) + steps_o( exp(length(A), 2) ). ciaopp can certify programs with resource consumption assurances [HALGP04].